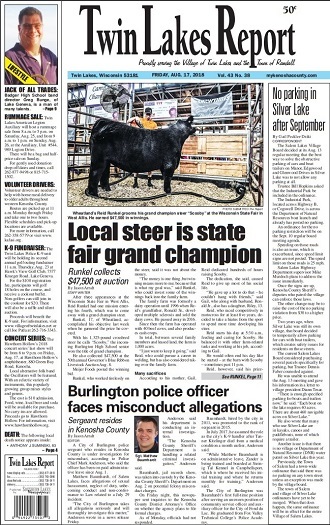 On the state stage, an area resident collected a large haul, earning $47,500 for a steer he showed at the Wisconsin State Fair in West Allis. In another news, the Report will have a story on a City of Burlington officer under investigation. GAS LEAK: Twin Lakes fire officials explained the circumstances surrounding a gas leak in the village on Aug. 10. NEW LODGE: Fox River Park plans to offer an overnight lodge to civic group and other specific organizations. In sports, Friday Night Lights return on Friday, when Westosha Central heads to Racine Case and the Panthers visit Kenosha Bradford. Find out how each team shakes out.